Special Offer for Socks Proxy Checker Users! 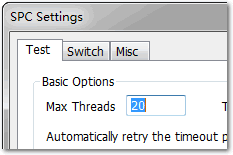 The new version can change the socks proxy of the IE and Firefox. Socks proxy supports https and high anonymity naturally, so you can use socks proxy to access all (http/https) websites. Read more about how to use socks proxy. In fact socks proxy is versatile proxy for all your Internet activities while the ordinary (http) proxy can only be used for surfing. You can use socks proxy to anonymously send email by SMTP, transfer file by FTP, chat by IM/IRC software and play online game. Socks Proxy Checker (SPC) can check socks proxy for the details such as speed, version, country, region, city, smtp, and udp. It can find the best socks proxy for you. Try it now (2.8MB, Windows 10/8/7/Vista/XP). There is no time limit. * You can easily download daily fresh socks proxy using SPC by just one click. 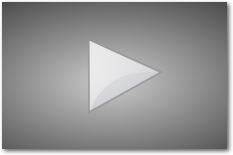 * Please read how to use socks proxy if you don't know how to use socks proxy. SPC professional version is more powerful than the free version. 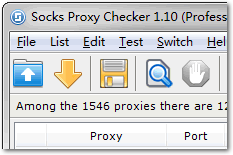 You can enjoy the full features of Socks Proxy Checker with the professional version. 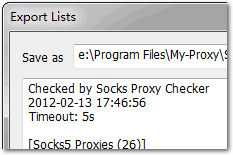 * With our socks proxy list service, you can download the socks proxies. 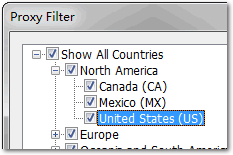 Notice that SPC Pro doesn't include the socks proxy list service. If you need proxy list rather than the software, please buy socks proxy instead. 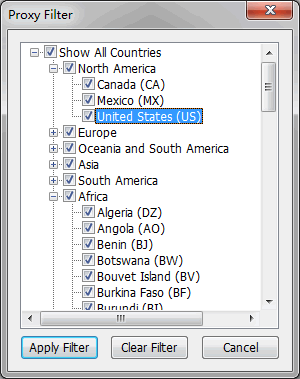 Both SPC Free and SPC Pro can download socks proxy list from us. Make sure you have read our Socks Proxy Checker Professional End User License Agreement before your purchase. If you have any problem about Socks Proxy Checker, please read the FAQs first. If you didn't find the answer, please post your problem in our forum or just contact us by email.